Currently, one of the most promising technologies for decelerating a spacecraft on an interstellar mission is the magnetic sail, which uses the deflection of interstellar matter via a magnetic field to decelerate the spacecraft. Scientists in the UK and Germany have come up with a quicker way to brake spacecraft on interstellar missions, by combining magnetic and electric sails. However, while the magnetic sail is very efficient at high velocities, its performance decreases with lower speeds. 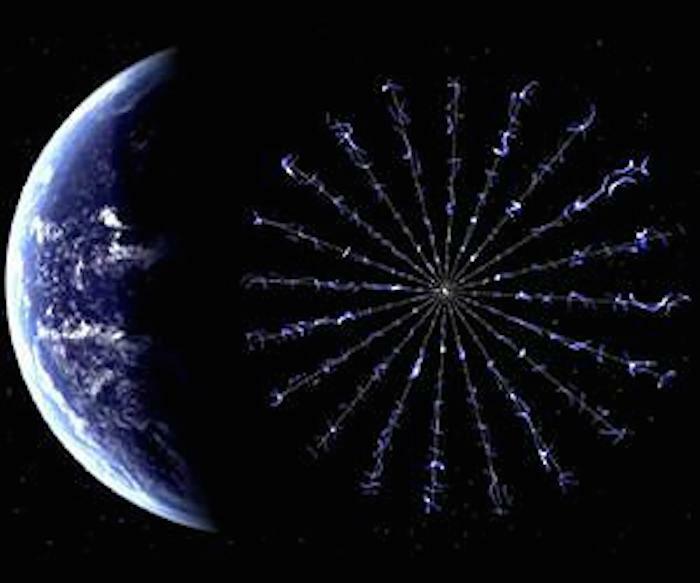 To solve this problem, scientists from the Technical University of Munich and the Initiative for Interstellar Studies in London have proposed combining the magnetic sail with an electric sail, which is more effective at lower velocities. "Msails fail to produce sufficient forces in the low speed limit and Esails require very large masses in order to decelerate from the high cruising speeds of interstellar missions," they wrote in their article, published on arXiv.org. "Using both sails sequentially outperforms using only the magnetic or electric sail for various mission scenarios and velocity ranges, at a constant total spacecraft mass." For decelerating to interplanetary velocities from five percent of the speed of light in a vacuum, the scientists calculated that a spacecraft with a total mass of 8250 kg would take about 40 years with a magnetic sail, 35 years with an electric sail, and 29 years if it has both sails.